After the decurtaining step, images are temporally linked to produce master sky frames which are used in the sky correction step. If possible, the sky correction frame is made from the science MSB itself eg. UDS and DXS surveys. If insufficient pointings are available within a single MSB then adjacent MSBs are used to increase the number of sufficiently independent pointings, with the constraint that fields taken within 5 degrees of the Galactic Plane, or centred on bright NGC galaxies, are not used for sky estimation. The sky frame is formed in a two-stage process. First each dither or interleave sequence is robustly combined (iterative median with upper k-sigma clipping), after first scaling to a common level, to remove the majority of real images. 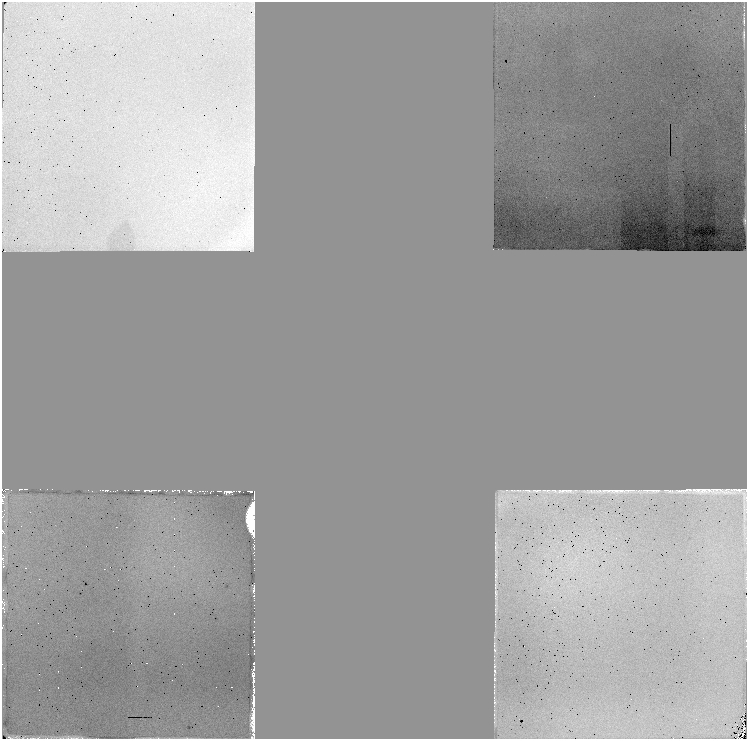 Then a sequence of independent field centres of these intermediate stacks are similarly robustly combined to form the actual sky frame used. In practice, the sky frame is an attempt to correct for mainly additive artefacts including scattered light, residual reset anomaly, and illumination-dependent detector artefacts; although residual flat field errors are also corrected to first order. Sky correction proceeds by scaling the chosen sky frame, generally the nearest in time to the target frame, to the data and additively applying it, whilst maintaining the original overall target frame sky level. A typical J-band dark sky stack (orientation on-sky with N to the top and E to the left) is shown here and highlights several features of the sky correction. Residual gradients introduced by the twilight flatfielding strategy are negligible across detectors and are well below the 1% level. The pedestal offsets can be quite large, typically ±4% of sky (it is known they are additive since there are no equivalent photometric systematics). The most variable quadrant on detector #4 also stands out. There is no measurable fringing present in any of the passbands in any of the filters. Note that sky subtraction is not currently carried out in the summit pipeline. All sky correction frames are formed from frames matched in passband, readout mode and exptime/nexp. These strategies are discussed in more detail below. It is well known that no matter how good the masking algorithm, without an external deeper mask, sky estimation for single pointings based on a limited number of frames and dithers leaves some residual object flux, below the pixel-level detection limit, in the sky frame. The residual is diluted by a factor O(1/n) when doing clipped averaging but still leads to oversubtraction of faint outer profile wings by this amount and thereby introduces a small systematic bias which progressively increases at faint magnitudes. The good news is that for point sources significant differences only arise for heavily saturated objects. Even for extended sources measured in the default apertures there is very little difference. However, the bad news is that when using Petrosian fluxes, where the extended wings have much more impact, it is a lot worse and the bottom line is that a large fraction of ALL extended sources are noticeably affected. The only way to alleviate this problem is to either use a much deeper object mask as input or to ensure that several pointings, e.g. a tile sequence, are used for the sky estimate.